Southern Banana Pudding Recipe With Made From Scratch Pudding/Custard – that’s quite a mouthful isn’t it? 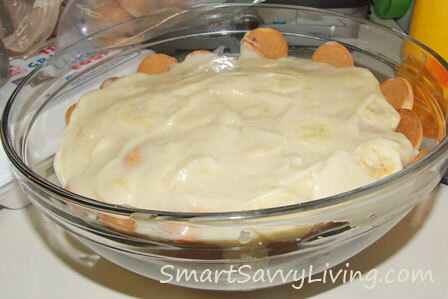 Banana pudding is a common dessert with many different variations, at least here in the south. Some people use vanilla wafers, while others use Chessmen Cookies. The filling can be made from scratch, or using boxed pudding or even a cream cheese mixture. Then the pudding can be topped with a meringue or whipped cream. I’m not sure about other areas in the states, but in the South banana pudding is featured on most restaurant menus and is sure to be one of the many desserts at any gathering. If you’re looking to impress a man in your life, I say banana pudding is also a pretty safe bet to make for him as I’ve never met a man that didn’t adore banana pudding. Heck, I’ll even admit I love banana pudding with all the creamy flavors even though the banana is admittedly not one of my favorite fruits – unless it’s frozen and covered in chocolate, which makes it taste more like ice cream anyway ;). 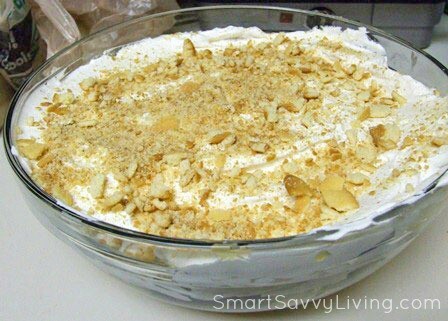 What the banana pudding looks like before the topping is added. This is what the cooked custard looks like. It is also fabulous on its own as vanilla pudding. Note that this banana pudding recipe is pretty versatile as far as servings. You can decrease the recipe for a small dish or double or even triple it if you’re making it for a crowd without any issue. 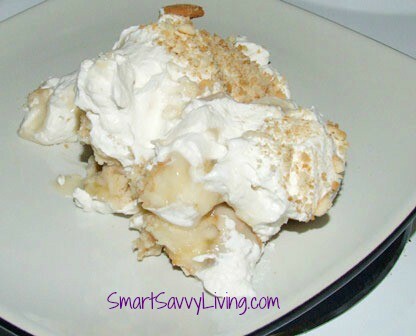 Even though the directions may seem on the long side, this Southern Banana Pudding recipe is rather easy and you can make the custard ahead of time to put together quickly. Plus, homemade banana pudding tastes so much different than if you use a boxed mix – in a good way – and it’s all because of the homemade custard, which is basically like homemade vanilla pudding. Heat milk, sugar and salt in heavy saucepan over medium heat until simmering, making sure to stir now and then to dissolve the sugar and salt. While above mixture is coming to a simmer, whisk the eggs in the medium bowl until thoroughly combined. 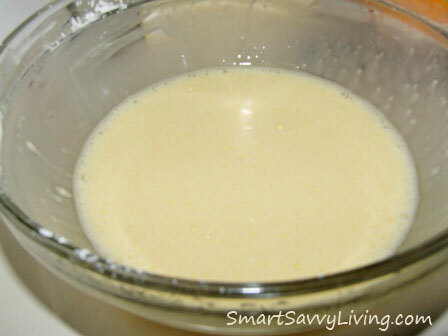 Whisk cornstarch into the eggs until the mixture is pale yellow - should take less than a minute. Don't worry if you still have lumps as you will be stirring more and can strain the custard if you like at the end. When the milk mixture is simmering, take off heat and take about 1 cup or a ladle of the milk mixture and slowly poor into the egg mixture while stirring to temper the eggs so they won't scramble. Once mixture has been tempered, pour it into the remaining milk mixture and return the pan to medium heat, making sure to scrape as much milk/egg/cornstarch mixture into the saucepan as you can. Whisk constantly until bubbles start appearing on the surface and the mixture is thickened and glossy - about 30 seconds to 1 minute. Remove from heat and then whisk in the butter and vanilla. If you think your custard is too lumpy, you can then strain it through a fine-mesh sieve over a clean bowl. If you are making the custard ahead of time or it will be sitting for a while, cover with plastic wrap directly on the surface of the pudding so that a skin will not form. Line the bottom of your serving dish with vanilla wafers. 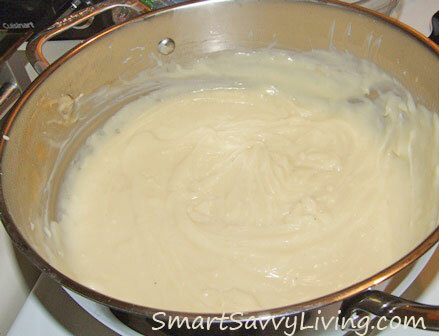 Pour 1/3-1/2 (according to if you want 2 or 3 layers) of pudding over the bananas and spread to the sides of the dish. Repeat with remaining desired layers with wafers, then bananas then pudding. If making 3 layers, I like to put a layer of wafers standing along the edge of the bowl before starting layer 2, especially if using a glass dish, to make it look a bit prettier. When ready to serve, prepare whipped cream by whipping the heavy cream with the vanilla and powdered sugar until soft peaks from. Spread on top of the pudding and top with crushed vanilla wafers, if desired. You can also add another ring of standing vanilla wafers along the sides of the bowl if you have enough left. 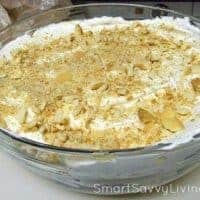 I hope you enjoy this Southern Banana Pudding Recipe With Made From Scratch Pudding/Custard – be sure to check out our other recipes!